This year has so far proven our smart meteorologists right. Their fear-engendering forecasts of bitter cold winter with heavy snow storms have been on point. We have had enough cold and snow to compensate for last year’s mild winter. And it’s not as if the winter season is on its way out. We still have some weeks to go. That means many of us will continue to complain of messy roads, slow traffic, and having to pay high heating and snow removal costs while others pitiably groan their lack of a stable and safe place to call home. Feeling helpless and hopeless, they endanger their lives every day sleeping on the streets or hopping from one friend’s couch, garage or basement to another. That really breaks my heart. I always feel heartbroken when I hear of or see people – especially women, children, the sick and the elderly – living very precariously and bereft of their dignity. This is more so when I know some suffer such fate for no distinct fault of theirs. Their place of work recently downsized or closed shop, leaving them jobless. They fell ill and could no longer afford the high cost of hospital visits and prescriptions. They are precious kids whose parents made bad choices. They are good neighbors who fell into the itchy hands of evil scammers. And all of a sudden, they moved from pleasure to pain, comfort to chaos. I keep reminding myself that I cannot solve the problems of all homeless persons in metro Detroit but I honestly wish I could. I wish I could eradicate the conditions that lead to homelessness and unbearable suffering. I wish I could collaboratively perfect early warning and intervention methods. I wish I could at least make homelessness as temporary as a metro Detroit snowman. I wish I could make my inquisitive but compassionate children and their friends understand that, no matter how hard and long I try, I am unable to ensure they never get to see a needy person again on their way to school, library, sports meet, movies or groceries. Seeing homeless persons on the streets makes them feel as though their dad is not doing enough. “Dad, why are you allowing this person to be out here in this cold weather?” they’d ask me, not knowing that some are actually panhandlers, not homeless persons in need of meaningful help and hope. For now – and in the foreseeable future – I will continue to do all in my power to help individuals and families around me escape the scourge and stigma of homelessness. 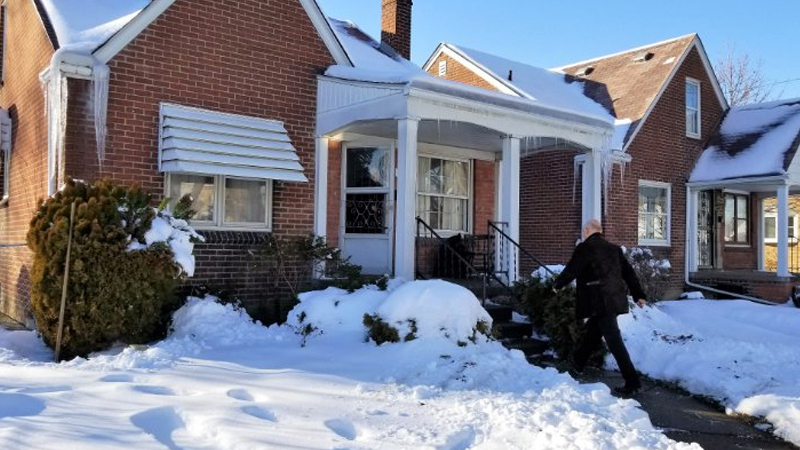 In the first weekend of January, my large team and I partnered with the City of Detroit to organize a volunteer outreach to homeless persons in Detroit. It was so successful that we followed up with a Big Game Day Party for Homeless Detroit on February 4, affording over 250 homeless persons the opportunity to watch the big game on big screens in a friendly atmosphere and with nice refreshments, food, non-alcoholic drinks and on-demand case management. Twice this fresh year, I have had the pleasure and privilege of presenting keys of fully furnished houses to two homeless families who felt they had nowhere else to turn to. On January 17, I welcomed a working but homeless single mom of 5 kids, including one who’s on wheelchair because of a neurological disease, to a 3-bedroom house with basement we furnished and stocked with food. I still remember and cherish the joy she exuded on receiving keys to the house. And just yesterday, February 12, it was the turn of a family of 7 – a terminally ill mother, a sick father and five kids, including the one who’s mentally challenged. I gave them keys to a furnished 3-bedroom house, knowing that the house would go a long way in giving them the stability and peace of mind they so greatly needed. As you read this, perhaps in the comfort of your home or office, passionate requests are coming in through our social media pages and phone lines for our housing program for working but poor families (with children). Many families are in dire need. Many want us to step in pronto and rescue them from the fiery jaws of homelessness. And my team and I do rescue as many as we can… and would like to rescue more. I was pregnant and had a 4 year old as well. I was too sick from pregnancy and ongoing anemia to work and lost my home. Staying in my friends basement with 2 kids was hectic and there was always an issue. It wasnt good for me or my children. I want them to have a safe place to call home. Their own. I’ve been staying in one of the DRRM buildings for about 6 months now. It’s small and isn’t much but it’s the world to my kids and I. I have no family or friends to help so making ends meet is still hard. I just want a roof over my kids heads and food in their belly.i appreciate the small things so much these days.